Good lord, is that Spanish Moss? If so, it's very luxuriant. You know they use that as a fixative in potpourri. does this mean the same one sock myth goes for TREES too?! The first thing I thought of when I saw the picture was "a fuzzy green horse head". Am I wrong? I do see the sock resemblance too. Did you try this tree sock ? Warm with a perfum of ground. It is better that cold with a smell of foot which stinks !!! Thank you. 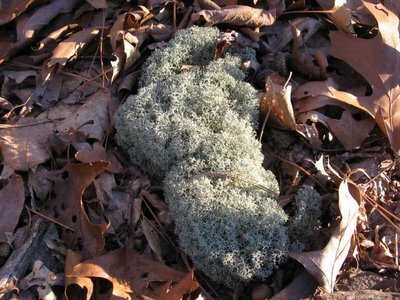 Actually I'm not sure what kind of moss this is. I found several mounds of it growing together on the forested ridge above the farm. Of course I immediately named them the Mossapagos Islands. I just tried to upload a photo of them, but Blogger isn't cooperating. Check back here later for the link if you'd like to see it. No, I didn't know about Spanish Moss being used as a fixative in potpourri. Neat. Thanks for sharing! Hmmmm. Maybe they're like clouds and everybody sees something different when they look at them. I like that idea. Okay, for anybody who is interested, I've uploaded the photo of the Mossapagos Islands. Just click here.